he said, “Listen to my words: “When there is a prophet among you, I, the LORD, reveal myself to them in visions, I speak to them in dreams. Wow! Getting the definition of a star makes this blog about stars even more meaningful. 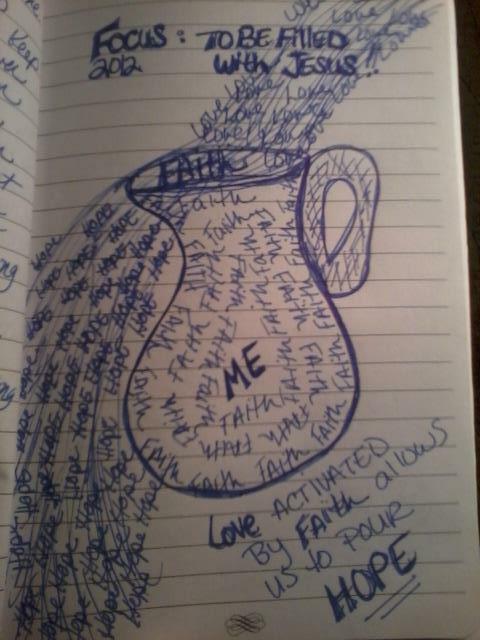 In my blog, Love Poured +Faith = Hope, I shared a drawing I did in a recent soaking session at church. 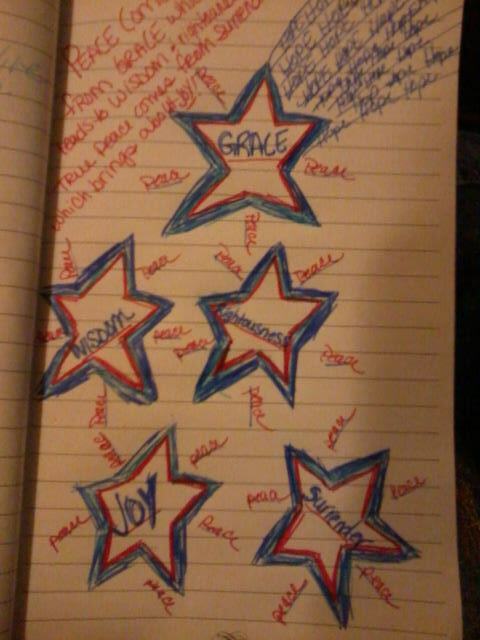 This Saturday I was led to draw stars. As you can see, it starts in the top right hand corner with hope flowing into the picture which creates these stars. The hope is a continuation of the previous photo (I will include that after this paragraph so can see it) and as hope flows into the picture and these stars begin to form, peace starts to flow and fill in the empty spaces. The coolest thing about this picture is that I was not the only one who had this vision of stars. The person behind me who is more artist than I, was creating a picture with star stickers and later a young girl gave her mom a hand-drawn picture with stars on it. Talk about confirmation! This particular Saturday night we were taking those people in our lives whom we want to see Jesus to the throne room. We named these people on paper, laid them on chairs and prayed over them the rest of the evening. We then prayed God would send people into our lives in the coming week with whom we could share the good news of the Gospel with. As one such opportunity arose last night , guess what he mentioned? Yes, stars! When God wants His will to be known, He works in such fantastic ways. It does not matter what demonation you belong to or what religious beliefs you have, God will speak to you the message He has in whatever form you are ready to receive it with. Whatever pew you sat on this past Sunday, I assure you that you got the message God wanted you to hear and so did others all around the world. Know where I get this idea? Two different people in two different states heard the same message on Sunday morning at their church that I heard at mine. Okay, back to the star theme. I really had no clue where God was going with the star theme, but just now when I looked up the definition of star, I got this cool picture in my head of we as individuals become shinning stars when we accept Christ in our hearts. As more and more of us “stars” begin coming together in agreement, we start to “Light up the Sky” where ever we are. The energy which we can create when we come together corporately in agreement can reach millions! God is calling us in these last days to gather together and get on the same page. We cannot reach the lost if we are not willing to put forth the sacrifice of some effort. I have another drawing which, goes with this series, but I am saving the best for last, and not being the greatest of artistes, I may have to redraw it to my liking. I think God is speaking greatly in these drawings, which I may let you in on a secret, I am a writer not a drawer! But, when you put these three drawings together, it just makes sense. I will be attempting to paint this on canvas in the near future and I think it will pull it all together and begin to make more sense than seeing it in pieces. I am not sure where God is going with all of this, however I assure you, this Jesus Freak is ready to move forward and push through it all! Are you ready to come with me? Previous PostJust PushNext PostWho Is Jesus to You? I am running (in the Spirit, of course) right beside you!!! Maybe a poster that we can obtain & hang as reminders?? God bless you, Brenda!!! A poster is a good idea! LOL my kid is more an artist than I so maybe the two of us can whip something up! Perhaps as I am finishing this first book up I can use the illustration for my second one and the poster can be a bonus item!